You see your dentist every 6 months to a year, so why shouldn’t your horse see a certified Equine Dental Technician? Equine Dental Health is important for a number of reasons; good body condition, better training experience, and to make the teeth last as long as the horse. Routine dentistry will prolong the life of the teeth so that your horse will have them, as they live longer. This also allows us to catch problems as they arise before they become too great. We now have the technology to fix/remove abscessed and fractured teeth. 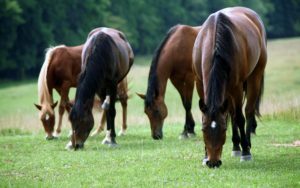 The main goal is to keep your horse as happy and healthy as possible.